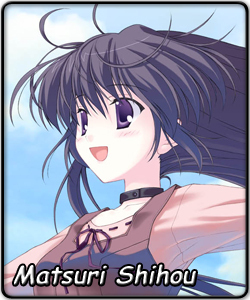 If met on a rainy day or during a nightly stroll, Matsuri would appear to be an ordinary girl. In truth, she is a centuries-old Yaka, an undead being who decays in sunlight. She has the power to cause things to instantaneously rot or decay. Because of her undead condition, she has never seen the daytime sky and is fascinated by images portraying it. She possesses an umbrella with the sky printed on its underside. Although she has no problems interacting with humans, Matsuri avoids creating bonds with them, believing herself to be a bringer of misfortune. When a boy called Yorito saves her from a Yaka hunter and hides her in his house, she plans on leaving him as soon as possible. But thoughts of escape leave her mind when she enters the boy’s room and becomes mesmerized by its ceiling – a photograph of wide-open sky. Matsuri is always calm, yet hardly passive. She constantly teases Yorito and walks her own paths, often acting without warning others. She has a taste for this rather esoteric tomato juice and believes machines require a good kick to work. Beneath it all, though, what caused her to separate herself from humans? What experiences has she had in her long life? And why do the skies hold such power over her heart?